Rolled in around 11:00 am with a new riding mower on the back of the truck. It’s an early-2000s Sabre (budget John Deere) model with a 48″ deck. Dad bought it from Linda and Dennis now that they’ve sold their house in Campbellsport. I had taken it home, washed it up, and given it a tune-up. I was also going to get new mulching blades for it but ended up ordering the wrong fitment; I’ll have to bring them up another time. The mower itself is in great shape but the bagging accessories look like they’ve been through hell and back. The bag unit itself is completely unsalvageable and the chute and blower assembly will require a lot of creative patching to get up and running again. But at least it cuts. I used the ATV ramps to unload the mower and decided to try it out by trimming the areas of the yard I had mowed/mulched last month. Even with dull, worn blades, it made quick work of cutting. I even tried a few areas with a lot of leaves and it never bogged down once. I can only imagine how well it’ll do when it’s got proper, sharp, mulching blades. I was just finishing up cutting around 12:45 when Red and Gunner pulled in, trailer in tow. Red’s mission this weekend is to gather up the aluminum cans he stored here several years back and cash them in. It didn’t take Gunner long to go into “Puckaway mode” and start sprinting huge laps around the yard. He’ll sleep well. 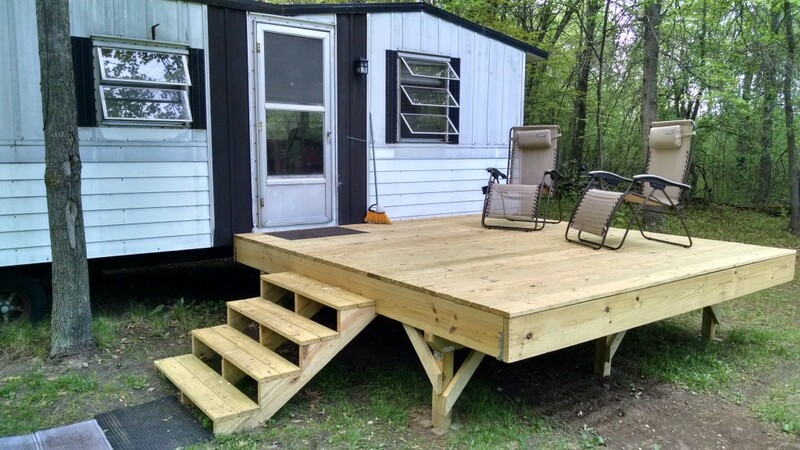 I showed off some of the recent improvements and additions (notably, the deck) and started in on my own project. I’ve wanted to do something better with the A/C in my trailer for a while. I’ve also wanted to get the stove out of there. It’d free up some much needed storage space and give mice one less place to hide and nest. We started by pulling out the stove and loading it onto Red’s trailer to get scrapped. The stove had a through-wall exhaust fan behind it, so we cut power and pulled that out next. I then spent more time than I should have carefully routing out the hole around the fan wiring. The fan was tapped into a continuing run of Romex and I didn’t want to potentially disable any of the trailer outlets. When I finally cut enough of the stud to move the wires more freely, I discovered where the run went: nowhere. It was for the long-ago-removed range hood light and fan. What a waste of time. Now knowing they served no further purpose, I capped the wires, shoved them up out of the way, and continued to work on the opening for the A/C. Between my cordless circular saw and Dremel Rotozip, it actually went pretty smoothly. After reinforcing the new opening with some cutoff 2x3s left over from the trundle bed project, we dropped in the A/C. Fits like a glove. After starting it up, I went to seal up the cracks with Great Stuff. This proved to be an even bigger time waster than the fan wiring debacle. I had completely forgotten about the large vent holes in the top of the A/C so, as the sealant started to harden, you could hear it slapping the fan blades like a playing card on a kid’s bike wheel. We took the A/C back out and I set to taking it apart. At this point, Red wisely went off in pursuit of his cans. The situation wasn’t as dire as it could have been. The Great Stuff dripped and hardened entirely on the fan blades and surrounding shroud and wasn’t gumming up the fins at all. Also, taking apart the A/C allowed me to give it a long-overdue cleaning. The fins were caked with old dust and grime and now you can see through them again. That’s got to have an impact on performance. Once everything was back together again, I squeezed it back into the wall. I’ll bring up some aluminum flashing and silicone sealant next trip to seal it properly. After cleaning up my tools and supplies from the A/C effort and vacuuming up all the sawdust and metal shavings, I used some bleach-based spray cleaner to wipe down the walls and floor where the stove had been. You could see smoke where it reacted with the ammonia from years of mouse urine. Good to know we’ve reclaimed another area from the little pests. I found the jalousie window pane and framing that had been taken out of the kitchen window to accommodate the A/C and re-installed it. 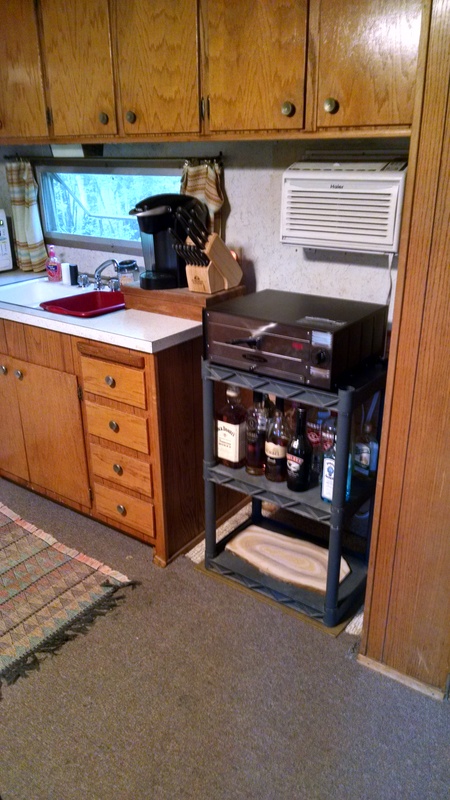 Also grabbed some plastic shelving from the pole barn to make use of the new stove hole. The trailer now looks much better inside and out. No more A/C hanging out next to the deck, a place to leave the pizza oven, and some natural light in the kitchen again. Red finished bagging the cans around the same time I got done cleaning up after the A/C. We ended the day properly with frozen pizza, beer, and movies. Gunner was out cold around 10:00. He and Red crashed on the couch, and I went back to my room. Lights out before 11:00. Up for the day around 7:30. Red had been up for a while after a rather fitful night; said he just wasn’t feeling up to par. He and Gunner were on the road by 9:00. After a quick stop in town for gas station coffee and breakfast, I switched gears to yard work. I started to trim back the overgrowth at the mouth of the driveway but abandoned that after about a half-hour. It’s too much of a hassle to lop off a few scrubby trunks, stop, collect the brush, grab the loppers, and start in again. 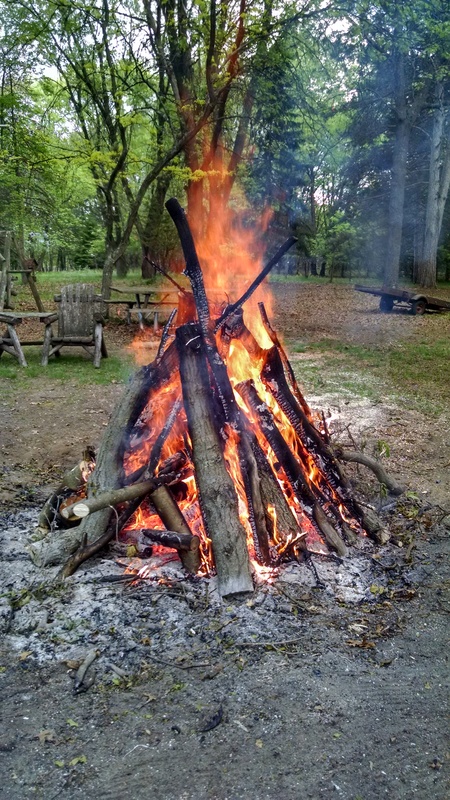 It’ll go much faster as a two-man operation, so I changed my focus to the area at the end of the driveway where, last fall, we got rid of most of a huge woodpile. 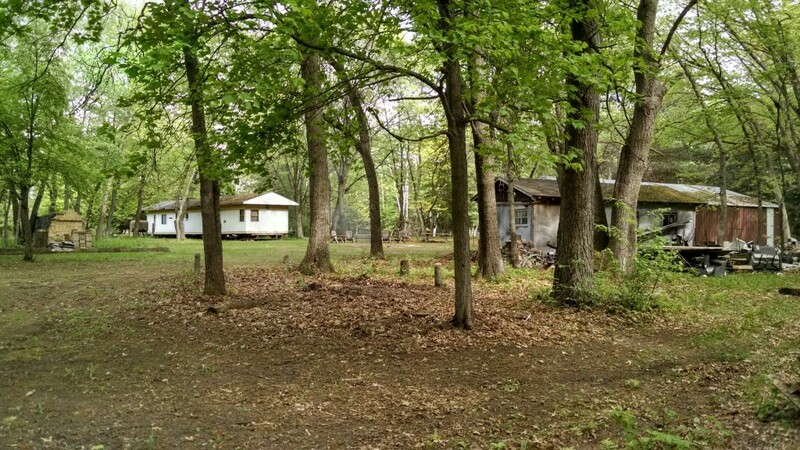 It was home to a few medium-sized trees, all either dead or dying. I ended up felling six of them, lopping off the branches, and taking the chainsaw to the trunks. I started a fire and burned these throughout the course of the day. 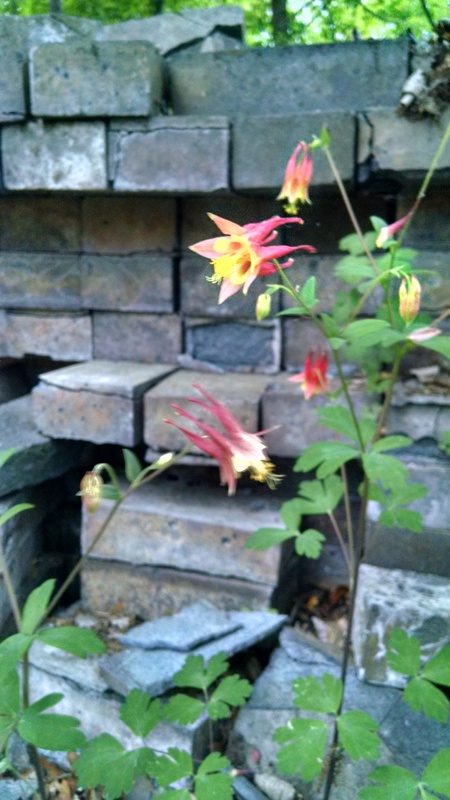 Noticed some pretty and unusual flowers growing at eye-level in the brick pile. I sent a picture to Mom, and she informed me they were Columbine. Neat. I didn’t know bricks could go to bloom like that. I took a late lunch break around 2:00 and ended up napping in the new recliner. That thing is incredibly comfortable. Not long after getting back to work on the trees, Farmer Joe pulled in. He was driving his neighbor’s truck and pulling a skid loader he just bought at an auction in Montello. It’s a lot bigger than the one he has now, which frees that one up for occasional side-jobs here. I’m looking forward to that. We relaxed in the chairs I brought up for the deck and he headed out around 4:00. I finished cutting up the rest of the trees and got the last few boards off of the wood pile. Tossed everything in the burn pit and put in a call for Christianos pizza delivery. It showed up just as I finished cleaning up all the branches and got my tools put away. Before dinner, I set up the heating stand for the portable shower tank on the deck and started the burner. By the time I was done gorging myself on pizza, the water was nice and hot. Of all the improvements and changes we’ve made here in the past few years, this shower only ranks behind getting real underground power to the trailer and the shed. It’s a game changer. I was absolutely filthy when I came in for the night but ended up squeaky clean and feeling refreshed. I checked on the burn pit, confirmed it was down to glowing embers, and called it a night a little after 10:00. Woke up at 6:00 to a bizarre sound. I looked out the bedroom window and there were two turkeys strutting their way through the yard, heading toward the marsh. They were only about 10 feet away, gobbling at each other every few minutes. It was a strange, cool thing to wake up to. Ended up reading in bed until around 8:00, had a breakfast of cold pizza, and headed back out to finish cleaning up my project area. I used the blue ATV to pull out the brush-hog and relocate it next to the scrap metal pile south of the pole barn. 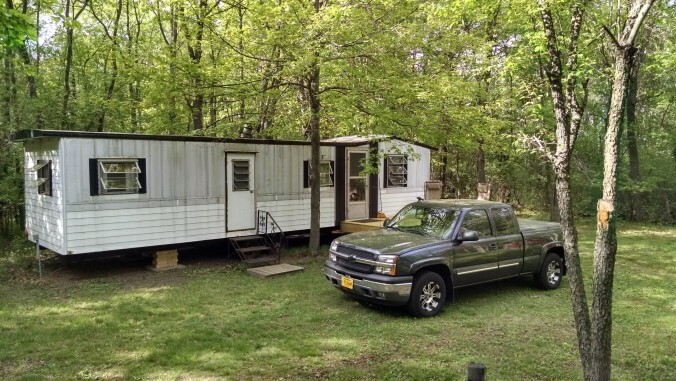 I hooked up the small flatbed trailer to the ATV and hauled away all of the corrugated metal panels that were on and in the wood pile, the junk tires, and the rolls of chain link fence. Even though everything’s still outside, it’s at least better organized and more out of sight now. All that was left to haul away were the two LP tanks. I found a 20′ length of chain in the pole barn and used some nuts and bolts to attach it to the lift points on the top of the smaller tank. I looped the chain around the hitch on the ATV and dragged it over to where I had moved the brush-hog. The larger LP tank was a little more challenging. I didn’t want to try dragging it since I didn’t think the ATV would have enough weight to get it anywhere without just tearing up the ground. I backed up the large flatbed trailer to it, propped up the front end with a 4’x4′, and chocked the wheels with some cinder blocks. I hooked the chain to the lifting eyes and the trailer hitch of my truck. I put a little grease on the boards of the trailer and side of the tank to get things started and slowly pulled my truck forward. Once the tank was making contact with the trailer, I took out the 4’x4′. I continued to slowly pull the chain and the tank slid right up the trailer, stopping right over the axles. The trailer tipped forward but could be lifted by hand without much effort. Perfect. I unhooked the chain, moved my truck, went to hook the trailer to the ATV, lifted the trailer just enough to mate the coupling, and everything shifted. 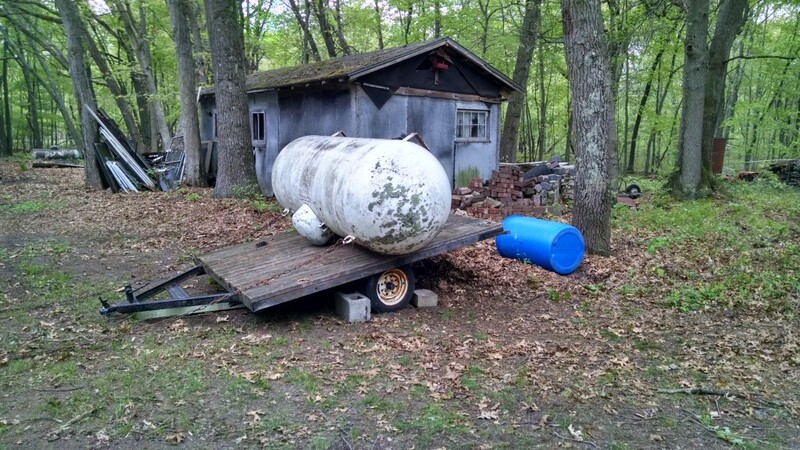 The trailer sprang up and the tank rolled right off the back. Damn. Take two. I did everything pretty much the same way all over again, but this time I used four tie straps to keep the tank in place on the trailer. Once it was secure, I had no issues pulling it across the yard to the east end of the pole barn. I unhooked the tie straps and–purposely this time–rolled the tank off the back of the trailer. It landed right-side-up exactly where I wanted it. Now the driveway approach is finally cleared out all the way to the gray wood shed. I packed up my tools, cleaned up the trailer, and was on my way out around 6:30. Perfect weather all weekend, no bugs, good company, and lots accomplished. A successful trip by any measure.